The extreme end of the continuum is verbal abuse. The middle is various forms of disrespect. And the mild end is annoying but not necessarily disrespectful behaviors. This article will focus on how to handle kids in the middle and milder ends of the continuum. Nevertheless, I will begin by briefly discussing the extreme, verbal abuse end of the continuum. The extreme end of the inappropriate verbal response continuum is verbal abuse. Abusive language is generally a personal attack upon another person. It’s meant to hurt the other person and make them feel small and afraid. Verbal abuse often includes foul language and threats of violence designed to intimidate the other person to get them to give in. Kids who use abusive language and behavior want to attack you so that they can control you. These kids often don’t care about consequences and are not intimidated by them. For these kids, abusive behavior has to be handled very clearly and sternly. Parents often ask me why kids talk to adults in disrespectful ways? I believe children and teens do a lot of things because they don’t know how to express emotions appropriately. To make matters worse, they learn a lot from watching other kids and people around them who don’t know how to express themselves appropriately either. If your daughter is frustrated and doesn’t know how to show it, and she sees somebody else roll their eyes and make a face, she’ll absorb that lesson without even thinking about it. Then, the next time she’s frustrated at home, she’ll roll her eyes and make a face at you. If she gets a reaction to her eye roll, that will often just reinforce the behavior because she knows she’s gotten to you. 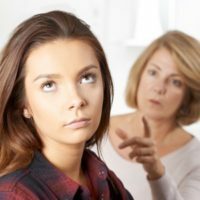 Don’t kid yourself: if you threaten your child by saying, “Don’t do that to me, young lady, or you’ll be grounded,” that will only make her do it more. Kids who act disrespectfully will not hesitate to push your buttons. It’s the one place in their young lives where they have actual power over someone. His final response to me was disrespectful, but also a bit clever and funny in a teenager sort of way. I became a little frustrated and annoyed, but I also knew better than to show it. I didn’t want to empower that behavior—or necessarily stifle it. Instead, my wife and I allied ourselves together and were able to laugh it off. And, eventually, it wore itself out. I personally think that the less you challenge mildly disrespectful behavior, the less you give it power. Remember, the less power you give it, the more it’s going to die its natural death. That process is called “extinction” in psychology. If you don’t respond to a behavior and give it power, the more likely that it will become extinct. It’s going to die out like the dinosaurs. But if you feed the behavior and play with it, you’ll only nurture the disrespect. Keep in mind that if you suddenly stop responding to the behavior that he will initially use it more often in an attempt to get it to work again. This is normal and is a sort of last gasp before the behavior dies. In my opinion, the worst thing you can do is challenge it inconsistently. Let’s say sometimes you let it slide and then sometimes you confront your child. When you do that, those behaviors tend to become more entrenched. I understand that many times it’s not easy to ignore mildly disrespectful behavior. That’s why I think it’s helpful to vent to your spouse, a friend, or a relative about it. In the middle of the inappropriate verbal response continuum is sarcasm. Kids generally manifest this in two ways. They either (1) make sarcastic comments when they’re feeling like they’re under pressure, or (2) they use chronic sarcasm as a way to manage their angry feelings safely. By safely, I mean it’s safer to show their anger through sarcasm than it is through any other means they’ve learned. Usually sarcasm is learned and modeled by adults. For example, when adults are upset at their kid’s performance, they may make sarcastic comments. These comments are hurtful and kids develop a defense to it by becoming sarcastic themselves. You’ll see kids who are really cynical and sarcastic using that language in all areas of their life. Its function is to help them deflect any blame while downloading a piece of anger onto the person who’s the target. Therefore, part of the response to sarcasm in kids is for the adults to speak differently. Personally, I think it’s funny when a comedian use sarcastic humor, but it’s not funny when a child or an adult talks to me that way. It’s belittling and inappropriate. And it hurts healthy and honest communication. It’s usually not hard to discover what your child is threatened by that leads to sarcasm. Sometimes it’s a secret, sometimes it’s a task he hasn’t completed, and sometimes it’s a power struggle. Whatever it is, once you’ve identified it, it becomes much easier to defuse. Asking in this manner is effective because it both identifies the issue and puts your child on the spot. And then turn around and walk away. When you walk away, you take all the power out of the room with you. If you argue or try to make a point, you’re giving your child more power. Of course, simply saying “Don’t be sarcastic” is an appropriate response and is useful as a reminder to your child, but it doesn’t get to the heart of the matter the way that more pointed questions do. When your kids use this kind of language with each other, I know it’s hard as a parent to stay out of it. But you may be surprised to hear that I think you really have to try. It’s important for all your kids to learn how to stand up for themselves. Believe me, they’re going to get it in the schoolyard, on the school bus, or in the classroom. No matter what, they will have to deal with it. That doesn’t make it right and it doesn’t make it good. But the bottom line is that they need to build up a callous to these kinds of comments. Think of it this way: at the beginning of the summer, using a shovel hurts. You get blisters, and your hands are sore and tender. After awhile, they get calloused and then they don’t hurt anymore. That’s exactly what you want your kids to do with mildly sarcastic comments. When something rubs your child the wrong way, try to not jump in there unless something is being said that’s really abusive, disgusting, or demeaning. If that’s happening and your child escalates, intervene immediately and pull that child aside. Give him a choice of two things at that time: to either change his language, or to be removed from the group. Calling your child aside is important because often the embarrassment of being corrected in front of other kids can cause him to escalate even further. Is it the end of the world if you give your child a consequence in front of the other kids? No, but I think those things are best dealt with privately. If your goal is to get him to change his behavior, separating him from others gives him a better chance of hearing what you’re saying. It’s easy and natural to become irritated when your kid says, “Nice one, Mom,” or “Duh.” This is where you have to draw the line between what kind of disrespect requires your attention and what doesn’t. I think that things that are not personal attacks or which are not meant to demean you can be handled by just trying to ignore them. “Planned ignoring” is the key here. Planned ignoring is the concept where you decide consciously to ignore attention-seeking behaviors as long as they’re not overtly harmful or abusive to others. This is tricky because there are also terms which might be considered mild by some, but which are actually put downs that I believe you need to address. For example, when your child says, “That’s stupid,” to you, make no mistake—he means you’re stupid. And by the way, when you tell your child “That’s stupid” and he says, “Don’t call me stupid,” You should apologize. If you say, “Well, I didn’t say you were stupid, I said the behavior was stupid,” your child is going to see right through that. Parent mistakes like this are a good opportunity to model an honest apology to show your child how to take responsibility for a mistake. I believe there should be a consequence for name calling. Set limits on it very clearly and hold your child accountable. Every time he says the word “stupid,” to someone in the family, for example, he goes to bed 15 minutes earlier or has 15 minutes less electronics time. He should be held accountable. Don’t get into whose chore it is. If the noncompliance persists, then the show stops. In other words, whatever your child is doing is over for the time being. Have your child take a seat in his room without any outside stimulation such as electronics. Understand that when kids get over-stimulated, they get stuck. So the first step in getting them unstuck is to avoid stimulating them by demanding things. Start by taking away all the stimuli that you can. Sending them to their rooms and shutting off electronics really helps. And leave the room. If he wants his privileges back, he will comply eventually. If the rude attitude doesn’t stop then take them to the car. Then turn away from him. Use very simple, matter-of-fact language. Have a serious look on your face. You don’t have to look mean or angry, but don’t look like you’re cracking a joke either.